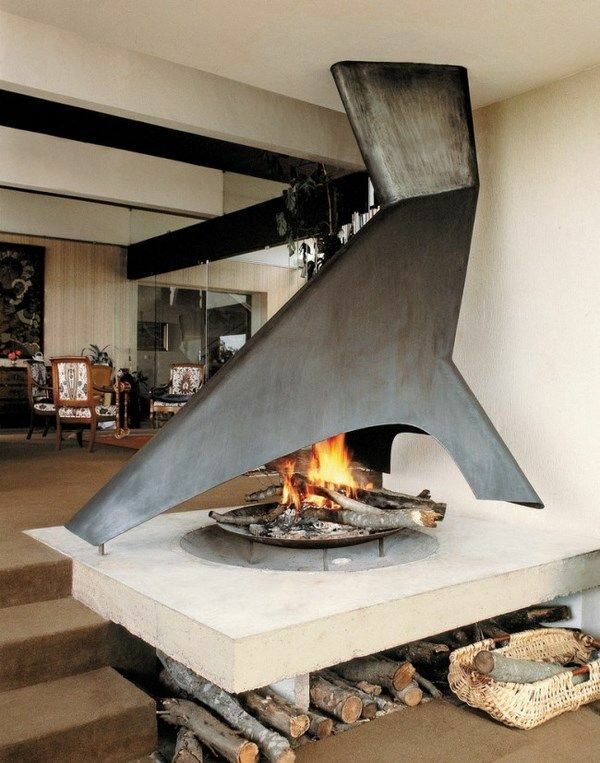 Modern fireplace ideas can be seen in many homes. We selected some of the most amazing fireplace designs and will look at the main types of fireplaces, the style and how they work with the interior and exterior designs, how accessories add to the look and enhance to the coziness of the home. It is nice to sit by the fireplace, listen to the crackling wood, feel the warmth and comfort of home, especially in a dark and snowy evening. Fire is the symbol light and life. An open fire soothes, enhances the atmosphere of the room, gives a feeling of warmth and coziness, of calm, peace, comfort. People in ancient times depended on fire and although we live in a hectic world, we are still attracted and fascinated by the dance of the flames. 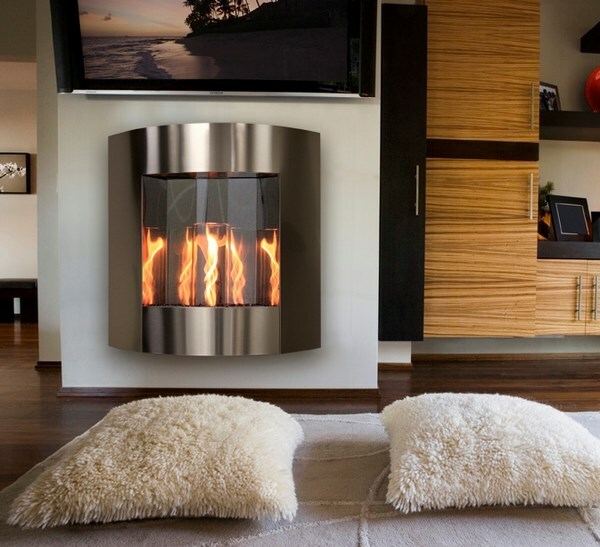 Modern fireplaces are a beautiful element of the interior, which makes any home look more comfortable and harmonious. You can live in a spacious house or in a small apartment and the wide variety of designs gives you an opportunity to enjoy the warmth of fire and the feeling of closeness which no other interior element can provide. What is the best type of fireplace – a wood burning fireplace, a modern gas fireplace insert, an electric fireplace or a bio-fireplace? How to choose from the plethora of oppotunities? How to decorate the fireplace and integrate it organically into the interior, take advantage of the visual aesthetics and the enormous visual appeal of contemporary fireplaces? The good news is that nowadays the market offers endless choices, fuel options, accessories and finishing materials which allow you to create true masterpieces. 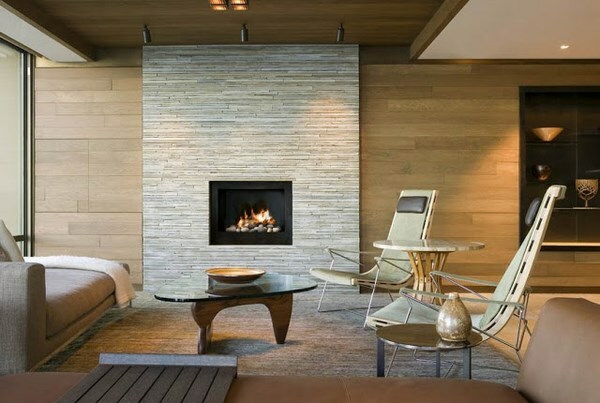 How to choose the right fireplace for a modern home? 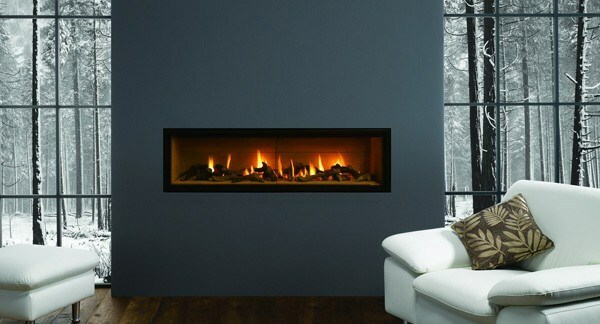 When you decide to install a fireplace in a single family house or in an apartment you will be faced at many choices. It’s amazing how many creative ideas can be implemented in modern interiors and make the fireplace a focal point or a background for your decor. It all depends on your imagination or ideas of your designer, and, of course, on the financial possibilities. 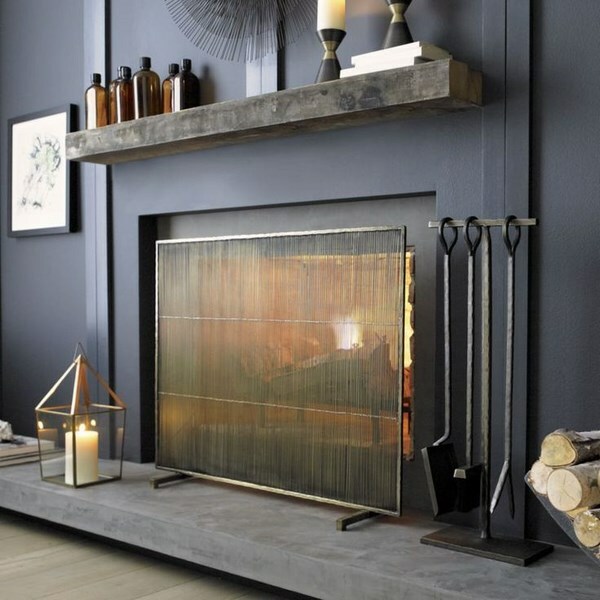 It is true – manufacturers and sellers will offer you many amazing designs but before buying or constructing a fireplace you need to take into consideration some very important questions. So – how to choose the right model for a modern home? The first important question is – where the fireplace will be installed – in a house or in a building apartment? This question is essential as the installation of a fireplace in a high-rise building is technically much more difficult compared to the installation in a family house. In apartment buildings you need to make sure that it is possible to install a fireplace and there is a chimney, you have to make sure that the safety codes are strictly kept, etc. Of course, the more complex the installation is, the higher price, which is an important consideration if you are on a budget. In such cases, wood burning varieties may not be a good option. Consider a gas or an electric option as alternatives. The second important question when choosing a fireplace for our interior is for what purpose you want it – would you use it for space heating or as an element of the interior with more of a decorative and aesthetic function. As you know, fireplaces differ significantly in price, so it is up to you to decide whether you want to pay more for a design which is not to be used as a home heating or will be used rarely. Modern electric fireplaces, for example, are so realistic that flames look very authentic and in addition, they have a heating capacity to easily heat a room of about 20 square meters. The third question that will greatly influence the choice of your fireplace is the location and dimensions. You have to think of the size – do you want a huge interior fireplace in a small room? It does not make much sense, does it? Think of where you want to install the fireplace and the furniture layout so that the final result will be a cozy and welcoming room and not a cluttered space. You may choose a corner or a double sided model, which is a great option for open plan living areas, a wall mounted or a free standing fireplace – the important thing is that it works with the interior of the room in the best possible way both aesthetically and functionally. Fourth question which you need to answer – what type of fuel do you want to use? Do you want a wood burning, an electric or you prefer a modern gas fireplace insert? Once you have the answers of these four questions it is time to think of the appearance. The main elements in the appearance of a fireplace are the firebox, the hearth, the chimney, of course, the mantel and the surround. The firebox is where the actual fire is burning, and the heart is half the fireplace in terms of appearance. In addition it is essential for the safety and the heart must be made of non-combustible materials. Fireplace surround will be determined by the overall design style of your home and will greatly contribute to the final look. You can choose a surround which will make your interior fireplace stand out in the room and attract the eyes or a surround that will blend with the overall interior so the fireplace is a subtle accent. 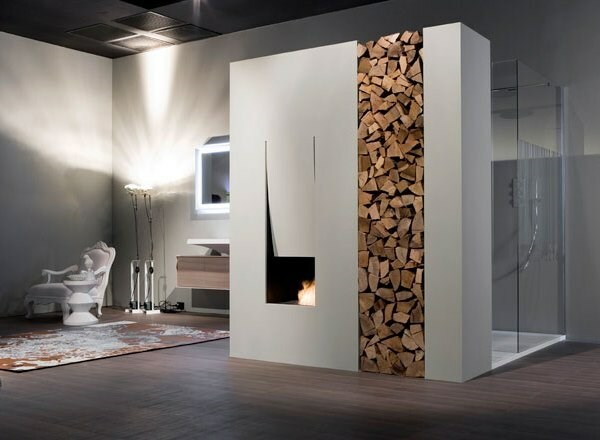 Rustic, hi-tech, modern, contemporary, etc – fireplaces come in almost any style. Symmetrical shapes and lines are the most popular choice and the strict geometrical proportions fit into almost any style. Of course, if you prefer asymmetrical or more artistic and unusual designs, you will definitely find something to meet your requirements and personal taste. 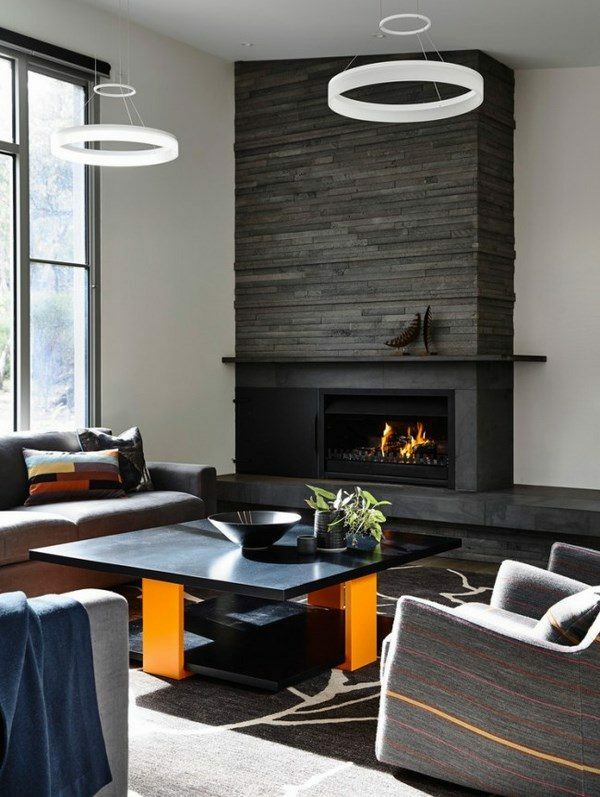 Having in mind that the fireplace is most often the center highlight of the interior, modern ideas offer a wide variety of finishes and decorating options. Stone, brick, stacked stone, ceramic tiles, wood – all these options are available and you should choose the one which will complement your home and the decor style. 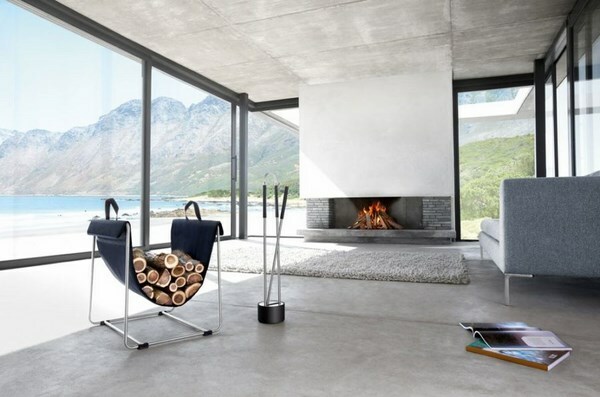 Most often designers and decorators present fascinating designs with onyx, granite, marble or travertine, sandstone, limestone, in minimalist fireplace designs we see concrete, metal, etc. 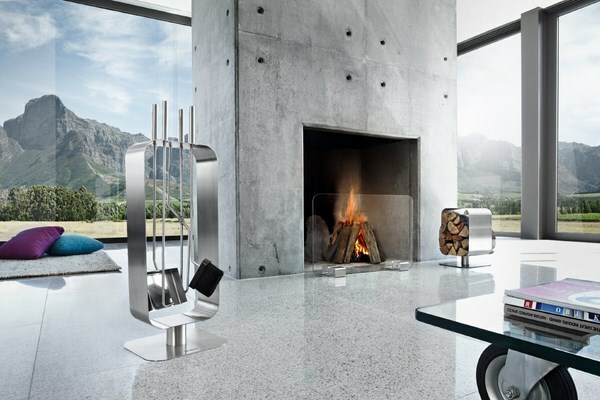 Different styles combine elements and often feature steel, glass and stone or creative, visually appealing and captivating artistic fireplace designs. 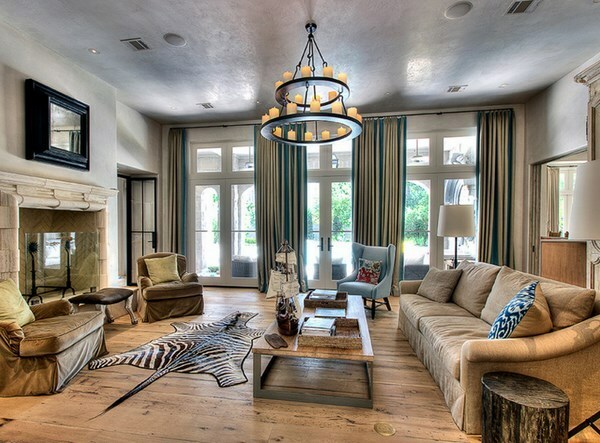 Let’s look at the most popular design styles and how they work in contemporary interiors. Classic designs in modern interiors create a visual contrast. Typically, such stylistic combinations can be seen in updated homes where homeowners chose to restore an existing fireplace. Classic style is timeless and the strict lines, precise geometry and neutral color palette stand out in a modern home. 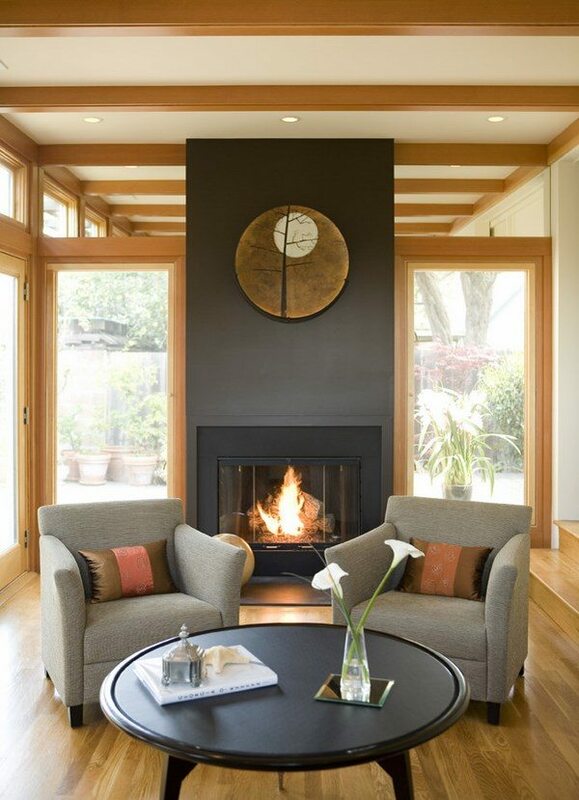 Stucco moldings around the fireplace underline the strict lines and the color of the surround is chosen to harmonize the color scheme of the room. Marble finishes or hearth give a luxurious look, elements of the Baroque style, wrought iron screens and accessories – all these details can be used as spectacular accents in a contemporary interior. 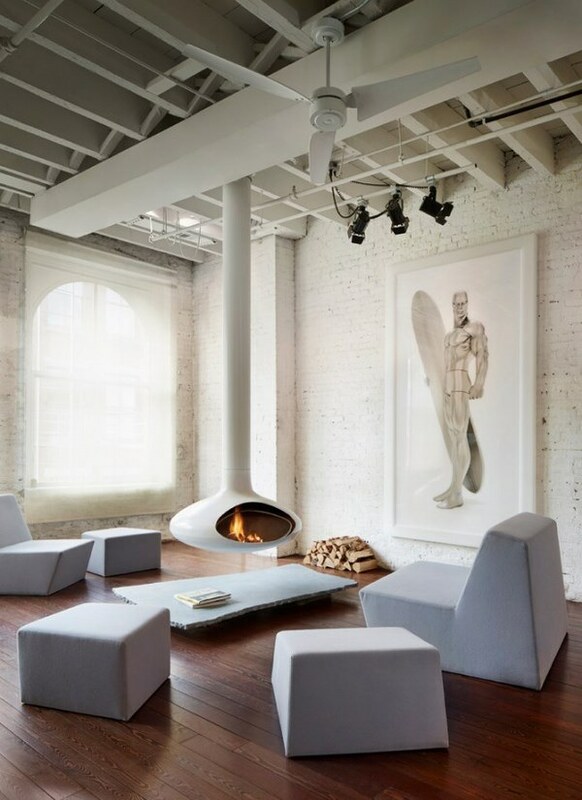 Minimalist fireplace designs reflect the growing trend in interior decorating and follow the principles of minimalism – strict lines, no decorations, often without a mantel. Sometimes the fireplace is the main focal point in a minimalist interior and we see intense shades of gray which contrast to a white interior. In interiors where the principles of minimalism are strictly kept a white finish blends with a white interior and the accent is on the flames. Modern fireplace design ideas combine neutral colors and bold, bright contrast colors to create dynamics and attract the eye of the viewer. The market offers numerous options – free standing , suspended , linear, round wall mounted fireplaces and depending on your personal taste and budget you can choose the one that will express and enhance the individuality of your home. 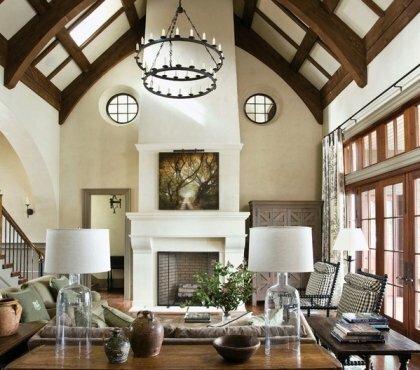 As much as classic fireplaces work in modern interiors the same applies for rustic design. They add incredible warmth to contemporary homes and integrating a rustic design in a modern home is not an impossible task. Some people prefer a typical natural stone surround and the monochrome palette of gray stone stands out as an accent. 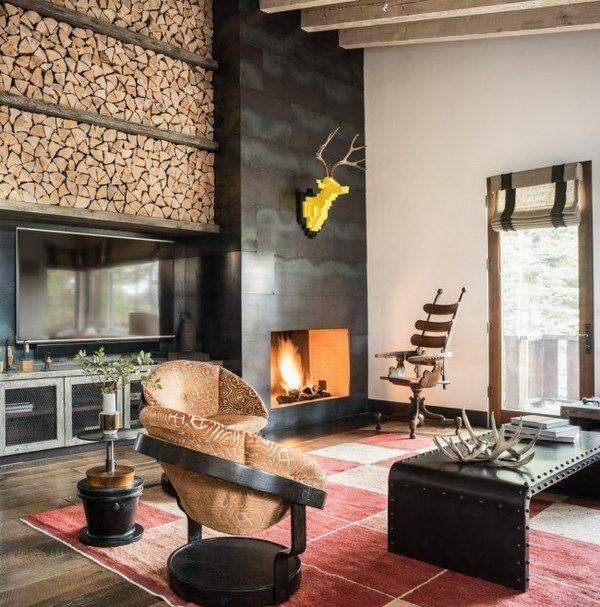 Others opt for solid wood decoration, or stucco but the overall idea is to turn a rustic fireplace into a focal point in a modern styled interior design. As you see, fireplace designs in modern home can be in a variety of styles. Simple and elegant classic fireplaces, richly decorated Baroque and Empire fireplaces, rustic or country style fireplaces with rich texture which create a unique comfort or compact and efficient contemporary fireplaces – everything is possible and depends on the imagination and financial possibilities. 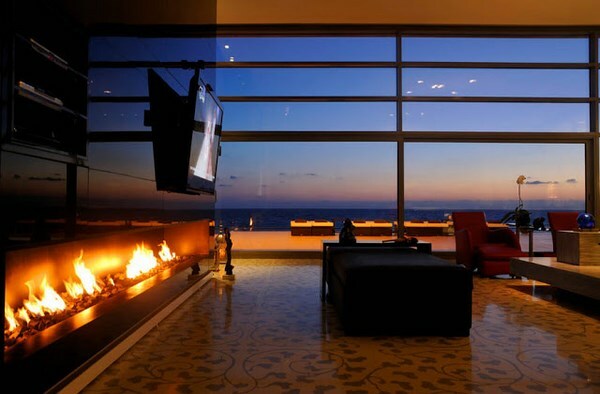 What you should remember is that the fireplace must be an integral part of the interior space. The style, materials, finishes and decoration must be in harmony with each other and and add to the atmosphere of the room, so these should be chosen with care and attention. 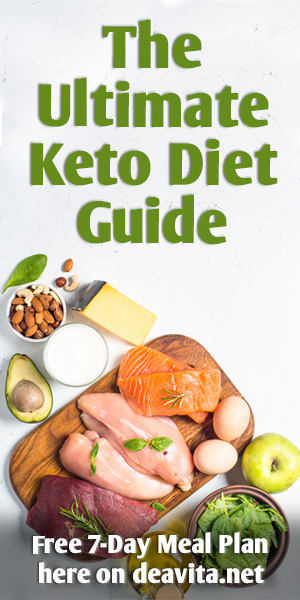 How to choose the type of fuel? Fireplaces differ not only in appearance but also have different types of fuel. Many design ideas are based on the classic type of fuel – wood. Wood burning fireplaces are the most popular type and are used for heating for centuries. In addition, they perform an aesthetic function, creating an inviting atmosphere and comfort in the home. How to choose a wood burning fireplace and what are its advantages? On the first place, wood burning fireplaces are a great element of the decor in almost any design style and add charm to even the modest and smallest home. They are a good solution for home heating during the cold season. These fireplaces are environmentally friendly and in terms of design options – the opportunities are endless. 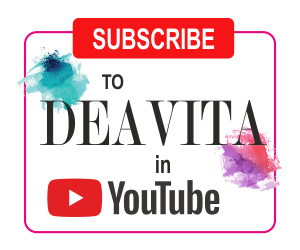 You can choose from numerous models and constructions, finishes – natural stone, marble, glass, wrought iron, colors and patterns to accentuate your style and individuality. Fire is a symbol of romance and coziness. 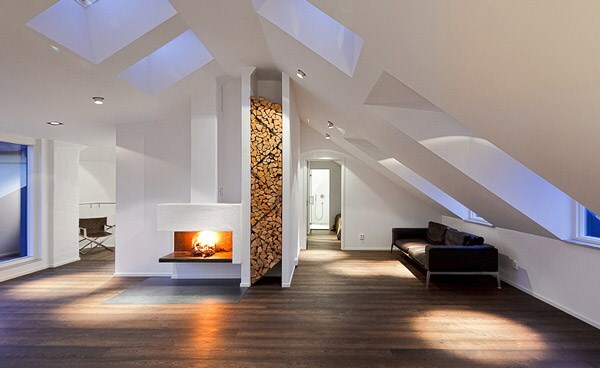 The bright, flickering flames, the scent of wood create a unique atmosphere of comfort in the home. The advantages of wood burning options can not be denied but these fireplaces have some disadvantages which you should consider prior buying or constructing one in your home. Safety is always a major concern – the open flames increase the level of fire hazard. The construction takes large amounts of time, requires considerable financial costs and labor needed for the construction. Wood burning fireplaces require regular cleaning of the chimney and the ash. The low efficiency (about 20%) at a high value is another disadvantage and it is more difficult to heat a large room. 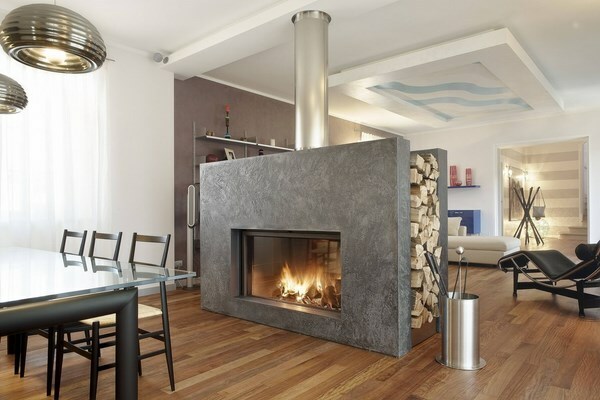 In an apartment building it is almost impossible to get a permission to install a wood burning fireplace. 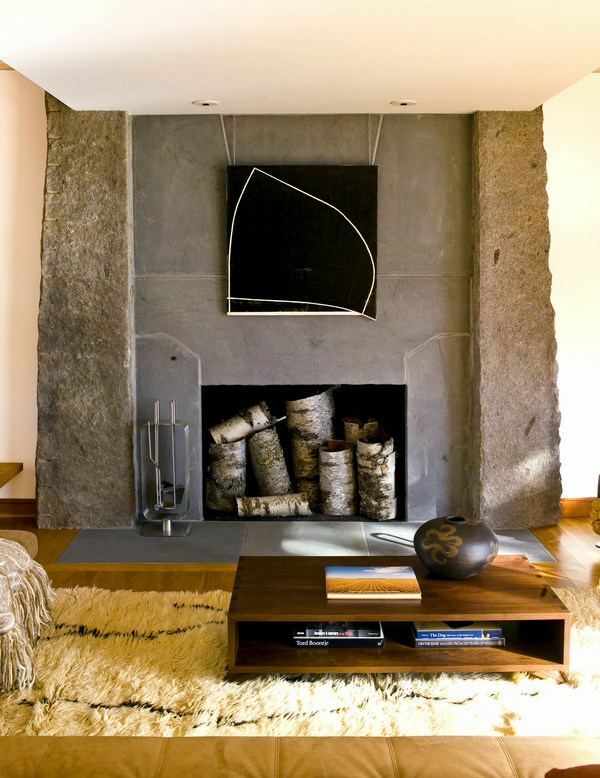 Even in a single family home, these fireplaces should be planned at the design stage and construction of the house. It is not recommended to burn a large amount of wood at once, as they will create a strong emission of smoke and fire. Firewood must be dry, medium sized, and coniferous species should not be used. Remember that a wood burning fireplace can not burn coal and its derivatives. To use such a fuel, a special insert must be provided. Fireplace inserts basically consist of a fireproof box surrounded by steel or cast iron and fronted by insulated glass, creating a closed combustion system. They are more efficient as you do not lose heat. Inserts can be powered by electricity, gas, propane, wood, pellets or coal. Electric fireplace inserts are considered as the simplest and least complicated type of inserts as there is no combustion thus venting is not required. In addition, you do not need a permit to install it and all you need to do is plug it in. The main advantage of electric inserts is the possibility to install them in any room. 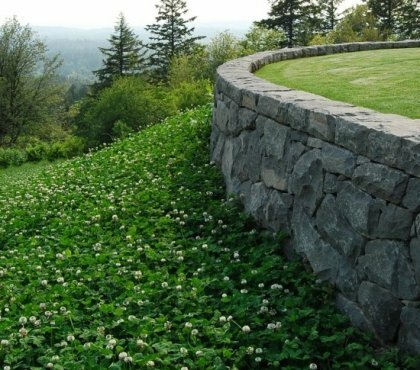 It is not necessary to build a chimney or any masonry. Fireplace can be transferred from one place to another, if necessary. Operation of the fire is completely safe, as electric fireplaces do not emit any gases, there is no fire hazard, smoke, etc. It is also important that an electric fireplace does not require constant monitoring, adding firewood or coal cleaning to remove ash, etc. These options come in a variety of designs – they can be installed on the floor, wall-mounted, freestanding, corner, recessed, etc. Modern electric fireplace inserts are manufactured to mimic the look of a wood burning option and the wide variety of design options allows you to blend an electric fireplace in any interior style – from classical and empire style to high-tech. Many models allow you to adjust the flame size and you can use them for heating or just for aesthetical reasons, which is a major consideration for people living in a hot climate. Electric inserts can be operated in different modes – idle mode, which will serve only for aesthetic appearance, as a heating system that works at a minimum power and as a space heating, which can warm up the room but will lead to significant power consumption. Most electric fireplaces are equipped with a thermostat which maintains an optimal consumption and constant room temperature. The wide variety of shapes, sizes and finishes of electric inserts provides an opportunity to find the best fireplace that suits your personal taste, home interior and of course, budget. Gas fireplace inserts are the ideal solution for homeowners who have access to natural gas or propane. They come as vented or ventless fireplaces and before buying one, you need to check the local building codes and get a permit, if required. Direct vent gas fireplaces are considered to be safer as they draw in outside air to keep the flame burning and exhaust all the combustion gases and water vapor released by burning gas. Ventless inserts have a higher efficiency rating – 65% to 99% – due to the fact that heat does escapes up the chimney but they exhaust gases which may be a concern. An advantage of gas inserts is that they can be installed in existing masonry fireplaces and can be vented through the existing chimney but any gas fireplace must be installed by professionals as a gas line needs to run to the fireplace. Gas fireplaces are more environmentally friendly than wood burning alternatives. Further to that gas inserts do not require much maintenance. You only need to clean the glass door of the fireplace. On the downside one can point out that gas fireplaces do not provide the crackle and pop of a real fire and you will not have the scent of burning wood. You have to install gas lines and it is essential that they are installed correctly so that there are no gas leaks. In case gas is not available you may need to use propane tanks or a natural gas storage container. Most homeowners choose gas fireplaces for the convenience and the efficiency. They have great heating capabilities and are easy to use, requiring only the push of a button to turn them on and off. Ethanol fireplaces (bio inserts) are an excellent choice for contemporary styled homes and do not require venting which means they can be used in any room of the house. 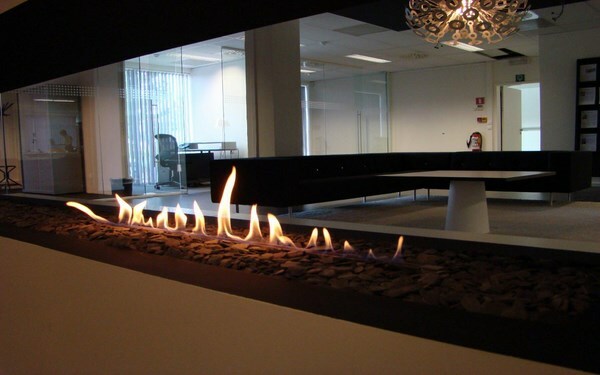 You do not need any special permits and approvals to install an ethanol fireplace. Ethanol is clean and when burning it does not emit any dangerous fumes. You will not see ashes or soot either. 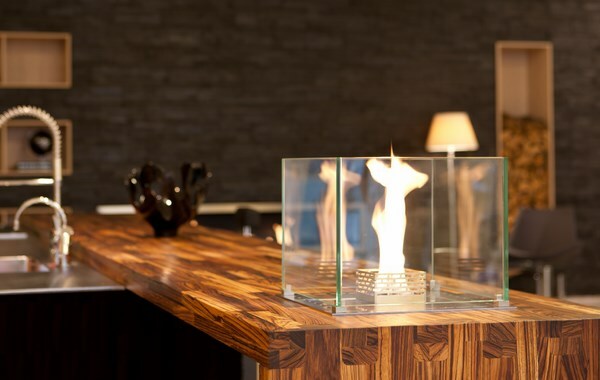 Ethanol fireplaces are very easy to use – all you need to do is take an ethanol bottle, pour the ethanol into the burner and ignite it with a long lighter. Ethanol fireplaces are almost maintenance free due to the clean flames. Wiping the glass with a damp cloth is almost all you need to do. If you have chosen a stainless steel fireplace, you can polish the steel and your fireplace will look as good as new. The major disadvantage of ethanol fireplaces is that while they give off heat, it is not sufficient enough to heat up a room as a traditional fireplace. Like traditional designs, ethanol fireplaces consume oxygen so you need to make sure to open a door or a window for getting some fresh air into the room every one or two hours. Ethanol models come in a variety of price tags and experts advise that it is better to invest in a more expensive model and avoid cheap fireplaces. Always ask if the product has been tested and certified. Gel fireplaces are designed to operate with gel fuel which is environmentally safe and they do not require vent, there is no smoke, ash, or soot, chimney to clean and you can enjoy the flames without being worried for maintenance, installation, etc. Installation of gel fireplaces is easy and you can do it as a DIY project which saves you the costs of hiring a professional. The market offers different types of designs – freestanding, wall-mounted, even tabletop models and you can choose the type as per your needs, taste and budget. 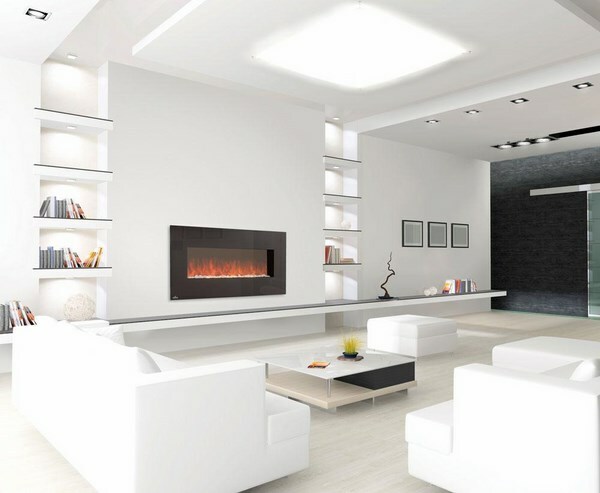 Gel fireplaces are considered to be versatile and offering great flexibility, but they do have some disadvantages which you should keep in mind. You cannot regulate the flames and in addition gel fuel requires some cleaning and maintenance. 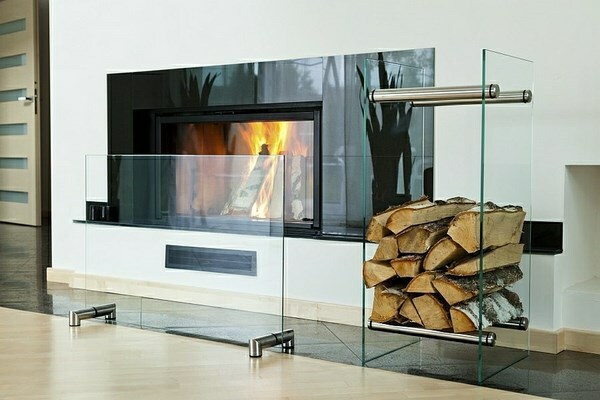 When you want to integrate a gel fireplace into a wall you may need professional help. Gel fuel is sold in tin cans and while this is an advantage as they can be easily replaced or refilled, this is also a disadvantage as tin dents and the metal wears out which is a potential hazard. 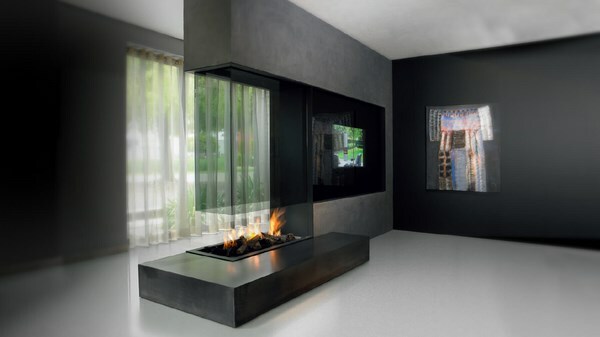 In general, experts’ opinion is that gel fireplaces are not as flexible and long burning as bio-ethanol alternatives. Tabletop fireplace ideas are the choice for homeowners who, for whatever reason, cannot build or install a fireplace insert or have a heating system yet would love to enjoy the flames of fire. 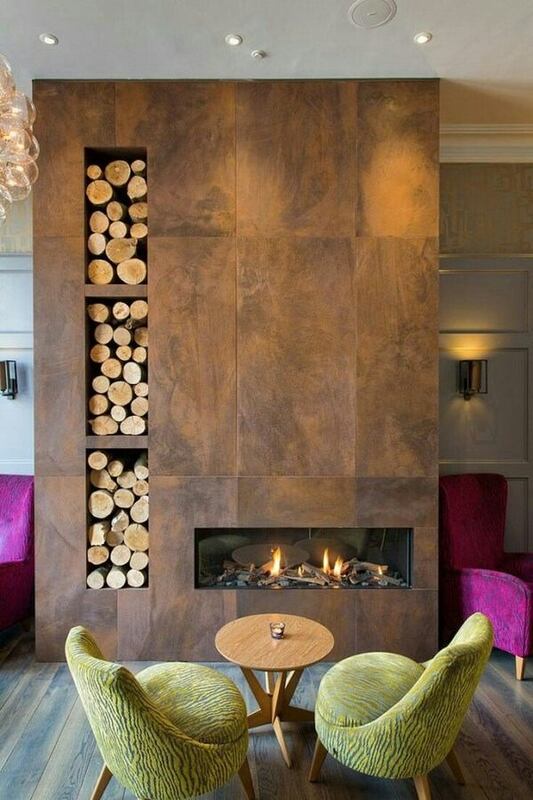 These fireplaces are a great option for those who want to think outside the box and move away from stereotypes. 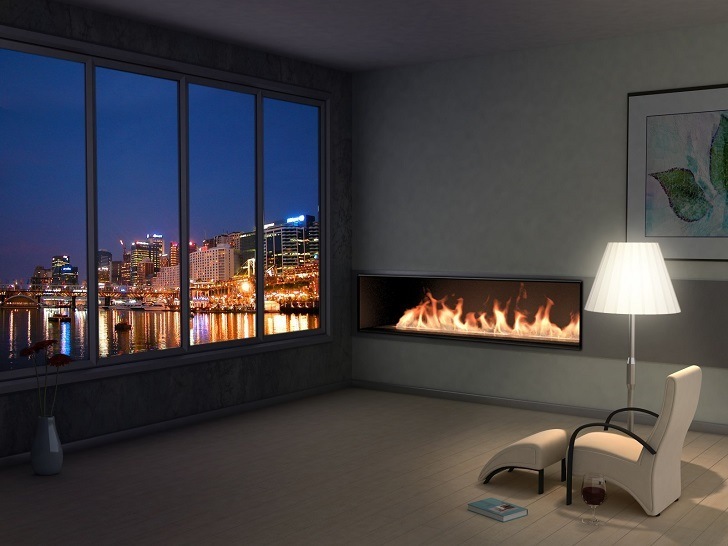 Tabletop fireplaces are the ideal solution for an urban apartment in a modern style. Most often tabletop models are made of glass which provides an opportunity to enjoy the view of fire flames and at the same time, keep them under control. The advantages of tabletop fireplaces are that they are easily assembled, you do not need any kind of permit from the fire authorities, you do not need a chimney and you can place them anywhere in the room and in any room – bedroom, study, office, living room, even bathroom. In addition, you can choose from a variety of sizes but typically, tabletop fireplaces are light, compact and easy to move. Those who prefer a bigger size will definitely find a model to suit their needs giving the home a sense of luxury and grandeur. Tabletop fireplaces are safe and environmentally friendly and using them does not require any special knowledge and skills. When choosing a tabletop fireplace it is very important to know the future place of location, to pay attention to its functionality and design. 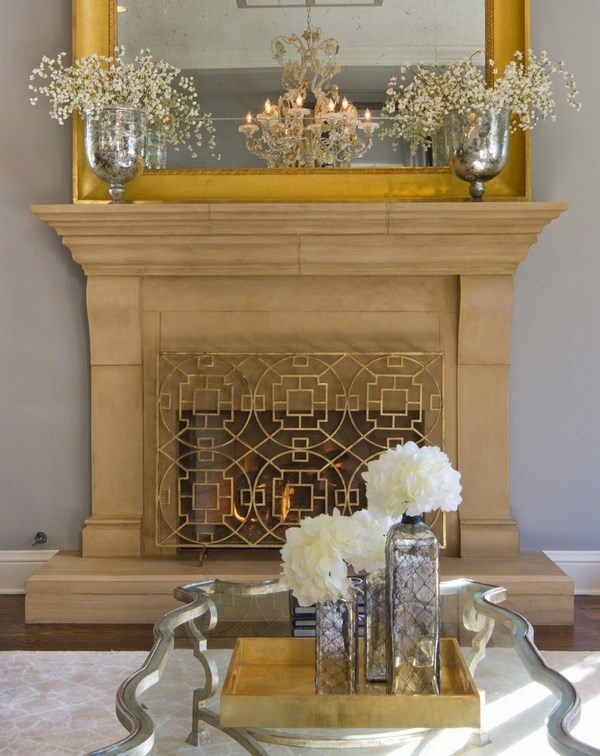 The fact that tabletop fireplaces do not require massive firebox or chimney makes them practical and versatile. They can weigh between 3-5 kg and can be placed safely even on a glass tabletop. Of course, a small and compact tabletop fireplace is not able to heat a large area but sitting beside it you will feel the warmth and fully enjoy the comfort. 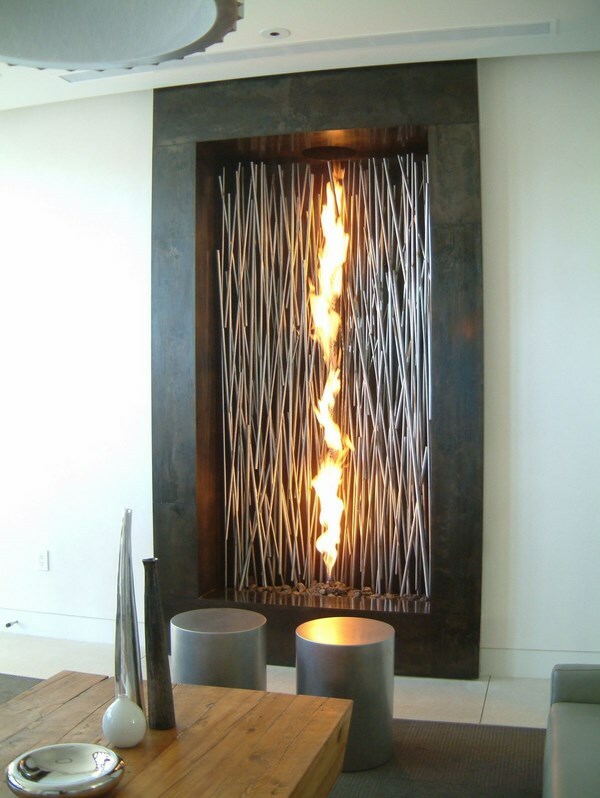 Decorative – when fireplace screens serve as a nice element of the interior. Screens should protect your home and you from hot sparks and embers and should harmoniously complement the interior of the room and the fireplace design. The right screen adds style to the fireplace and for families with small children and pets this is an obligatory accessory. Depending on the design, screens can be built in – the installation of the screen is carried out simultaneously with the construction or installation. They cannot be changed and remain a part of the fireplace for the whole period of its operation. Another type of screens are the ones that are partially built in during the installation process, i. e. – the forged parts are built in and the screen itself can be used when the fire is burning. Hinged screens are another type and the last option are the portable fireplace screens. Choosing the material for the screen will depend on the design style of the room and the fireplace itself. The most popular materials for protective screens are metal and tempered glass. There are screens made of more exotic materials and depending on the main function of the fireplace – decorative or heating – you can select the appropriate material from which the screen is made. Metal screens can be made of wrought iron, with exquisite carving and embossing, as well as a fine metal mesh. 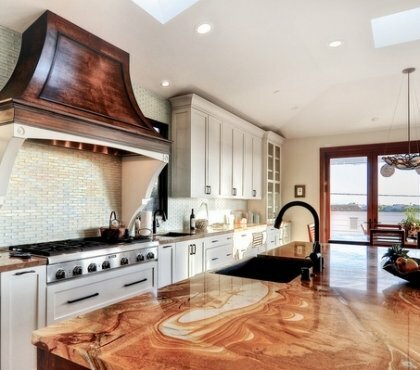 Such designs do not prevent heat distribution and look elegant and sophisticated. Modern fireplace screens can be made of stainless steel and have artistic and original design which accents on the decoration style of the home. If the main purpose is to use the fireplace as a heating system, the best choice would be a wrought iron screen or a metal screen. If the main function of the screen is decorative, it is better to opt for an original glass screen which gives the whole room a unique and exclusive look.The size of the fireplace screen should be based on the size of the fireplace itself. The variety of artistic designs will allow you to find exactly the fireplace screen, which will be a real highlight of your interior and create an atmosphere of elegance and special chic.